What is the character arc? It’s the name given to the personal growth experienced by the protagonist during the course of the story. At its heart every story is about character growth, and the plot and conflict are really just the vessel to both cause that growth and observe it. It could be argued that the dramatic question is only superficially about the plot. In reality it’s asking Will the character grow and develop enough in order to solve her challenges? This growth is a gradual evolution. This is, in part, why rising action is so important, because it allows the character to grow in stages. It would be improbable and unsatisfying for the reader if the character were to leap in an instant from, to use a cliché, zero to hero. The character's growth and development doesn’t always come easily either. In most stories the protagonist didn’t choose the challenges, and didn’t choose to have his life change. So this growth is often protesting and screaming, metaphorically at least, and perhaps literally too. But the character cannot give up (you as the writer make sure he can’t give up, by creating a crucible), and the birth of the new evolved character is often painful. If you think about it, change isn’t easy for any of us. It’s part of the human condition to want to stay the same. Your characters are no different. And your readers will empathise with this dilemma, and it’s part of what’ll keep them reading. The character arc is the journey from incompetence to competence, from fear to courage, from powerlessness to power, from callousness to empathy. It can involve the character beginning the story with a certain set of beliefs, and having those beliefs challenged and ultimately changed by the events of the story. Or, indeed, having those beliefs validated by the events of the story - in this case the growth is an increase in steadfastness. A very good example of character arc is in the film Phone Booth, starring Colin Farrell. He does a terrific job portraying the changing and development of the character during the story challenge - which he most assuredly does not choose. I absolutely recommend this film with a view to watching it analytically to observe the protagonist’s evolution. It’s very well done indeed. Also, Scarlett O’Hara in Gone With The Wind has a very pronounced character arc. She begins the story as a flighty young girl, and ends as a strong and determined woman. When you’re writing, it’s good to start with a flawed character, because this leaves plenty of room for growth. It’s especially satisfying if it’s this flaw which gets the character into the situation which forms the story conflict, and then has to grow beyond that flaw to solve the problem. You can have stories in which there’s no character arc - the James Bond series and the Indiana Jones series spring to mind - but they are more one-dimensional, and require lots of bang and special effects to keep our interest. I promise you that no agent or publisher ever turned down a novel or screenplay because it has a too well-defined and well-portrayed character arc. 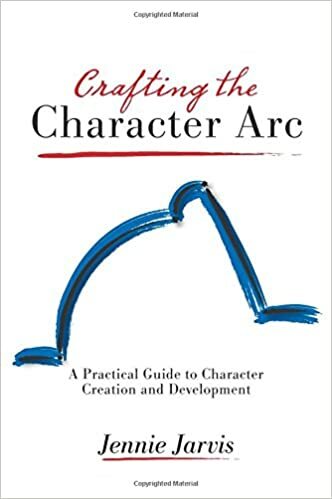 Click Here or on the image below to check out "Crafting The Character Arc".